Let us assist you the best way we know how. Glory Healthcare Services team provides one-on-one, in-home services to assist the elderly, differently abled, and clients of all ages after an illness or injury. Services are available 24 hours a day, 7 days a week. These services are provided by a registered nurse or also known as a Primary Care Nurse (PCN). 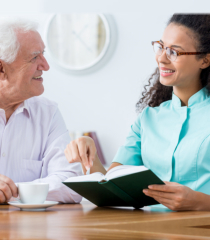 Our PCN’s take on the role of case managers, which means they are assigned to a client upon admission, and follow the client’s progress and supervise the aide until the case is discharged. 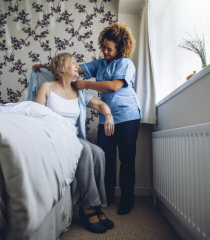 Home Health Aide Our aides provide assistive services such as bathing, dressing, toileting, ambulation, transfers, range of motion exercises as well as performing tasks listed under homemaker/companion services. Homemakers / Companions These services are light housekeeping which includes dusting, floor care, bathroom care, laundry, meal preparation and clean-up, medication reminders and social stimulation through conversation and activities. Transportation Glory Healthcare Services can arrange for ground transportation. Clients will be assisted by our staff during travel. This service is also ideal for clients who are recently released from the hospital or rehabilitation facility.